The U3A Theatre Group 2019 Concert is here with this year two performances. The first performance on November 25th was a near sellout as is the second on December 1st, in the MEMO Hall. The December show will be at 2PM. 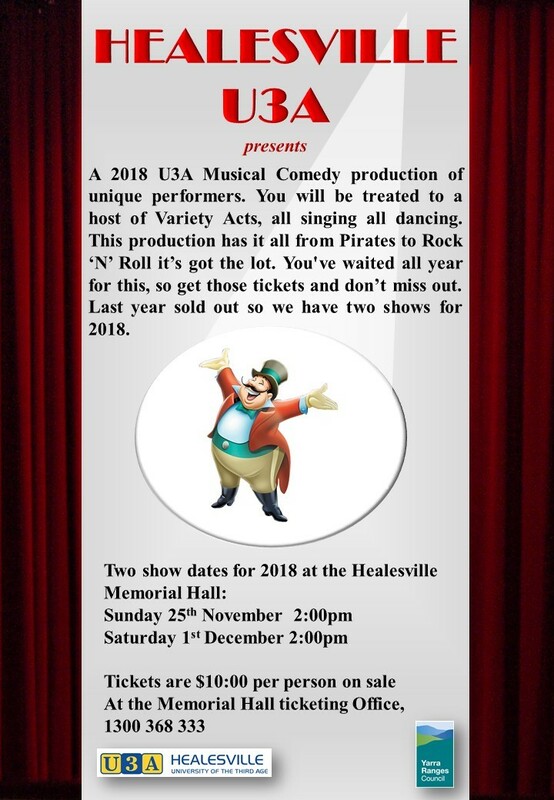 Two performances and relocating to the MEMO are testament to the increasing level of performance and to the increasing popularity of what has become a major U3A activity over the last four years. Every year since the first concert better material, better acting and singing, better sets and costumes and better light and sound have been a feature of these performances and 2019 promises to be no exception, the best yet! Any remaining tickets will be on sale at the MEMO ticketing office. The price is $10.